ARCATA, Calif.— The Environmental Protection Information Center and the Center for Biological Diversity today petitioned the California Fish and Game Commission to protect the Humboldt marten under the California Endangered Species Act. The Humboldt marten is a cat-sized carnivore related to minks and otters that lives in old-growth forests in Northern California and southern Oregon. Most of the marten’s forest habitat has been destroyed by logging, and the remaining martens in California likely number fewer than 100 individuals. Consequently, California’s Humboldt martens are at grave risk of being lost entirely from the state. Humboldt marten photo courtesy U.S. Forest Service. Photos are available for media use. The historic range of the marten extends from Sonoma County in coastal California north through the coastal mountains of Oregon. 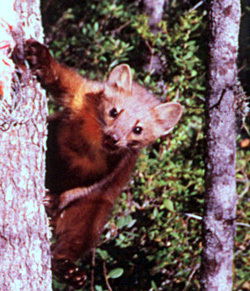 Once thought extinct, the Humboldt marten was rediscovered on the Six Rivers National Forest in 1996. Since that time, researchers have continued to detect martens in California, but also determined that Humboldt martens declined substantially between 2001 and 2008 and have not rebounded from that decline. The Fish and Game Commission has 10 days to refer the petition to the California Department of Fish and Wildlife. The department in turn has 90 days to make its recommendation as to whether the petition presents substantial information indicating that protecting the marten under the California Endangered Species Act may be warranted. After the department’s recommendation is received, the commission must make its own determination as to whether listing of the marten may be warranted. If so, the department will then have one year to conduct a more thorough status review of the marten. Though fewer than 100 martens remain in California, last month the U.S. Fish and Wildlife Service declined to protect them under the federal Endangered Species Act. The Center, which petitioned for federal protection for the marten in 2010, plans to challenge the decision. “The denial of protection is simply not a scientifically defensible decision,” said Augustine.